Mayor Yvonne Spicer will hold a community conversation to explore best practices, identify areas of opportunity, share personal experiences, and broaden understanding of diversity. 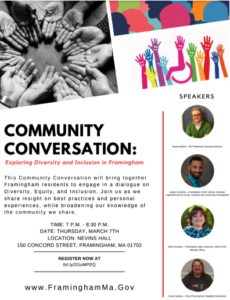 Taking place Thursday March 7, 2019 at Nevins Hall in Framingham City Hall, 150 Concord Street, from 7pm to 8:30pm. 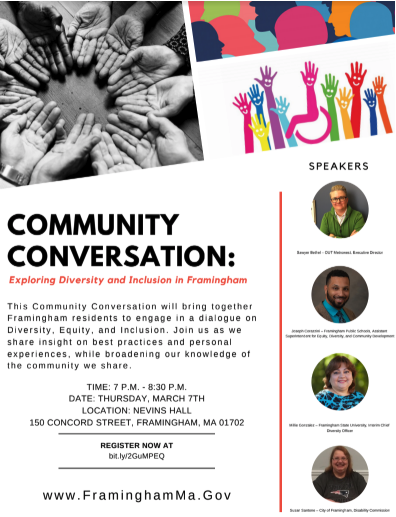 Residents, business owners, and the general public are invited to participate in this Community Conversation on diversity, equity, and inclusion. Posted in Archives on February 26, 2019 by Parwez Wahid.